In a medium saucepan, bring the water and soy milk to a boil. Add the oats, cover and simmer over low heat for about 30 minutes, until the oats are tender. Uncover and cook over moderate heat, stirring, until the oatmeal is creamy, about 3 minutes. 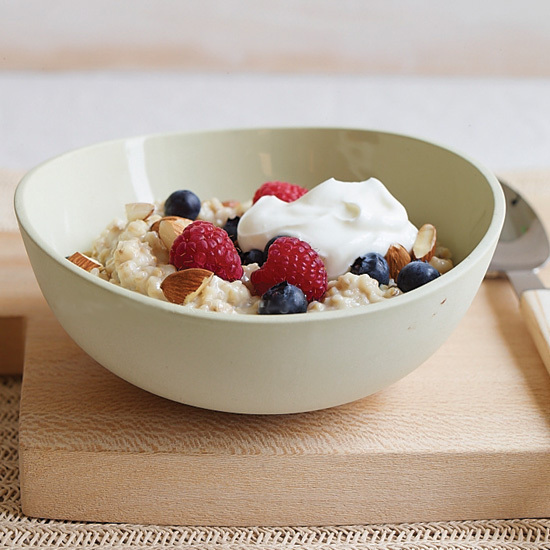 Spoon the oatmeal into bowls and top with the berries, yogurt and almonds. The oatmeal can be refrigerated for up to 5 days. Reheat gently. One Serving 274 cal, 8 gm fat, 1 gm sat fat, 38 gm carb, 7 gm fiber, 15 gm protein.